Over the years, I have heard from, and spoken with, many people who spent all or part of their childhood in cottage homes or other types of children's home. Many of these people have not said that they experienced any maltreatment while in the care of the homes. Some, however, remember physical abuse, sexual abuse, neglect and other mistreatment from staff members, other children or other adults connected with their children's home. Some people have reported such historic abuse successfully. Others have not been so successful or have chosen not to report it at all. For some, however, they have considered taking action but have not known how to go about it. The following information is provided for this group of people. 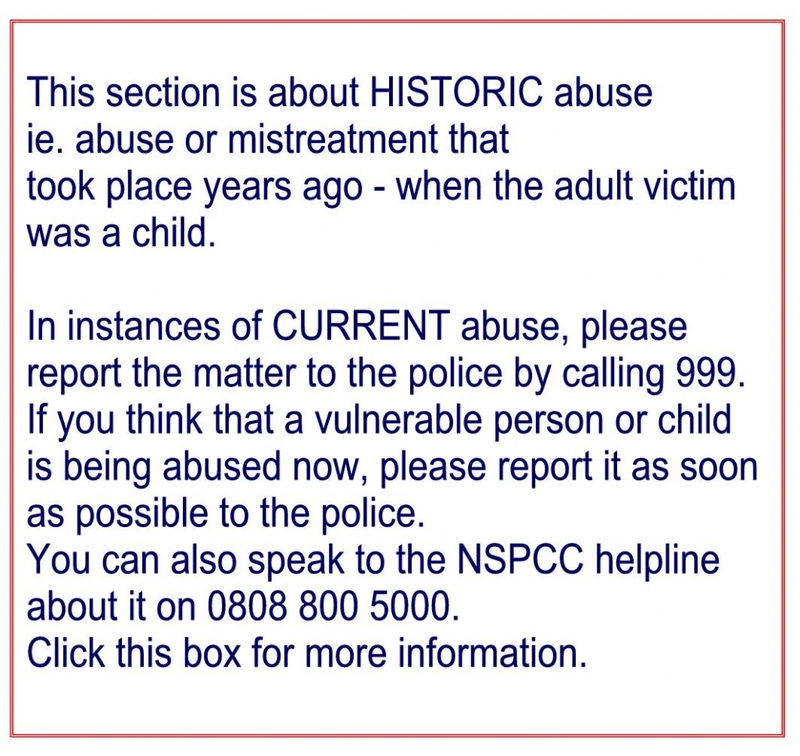 Decidiing whether and when to report historic abuse has to be very much a personal choice. It is not an easy thing to do and there is always the possibility that your report will be ignored. For some, the need to try and get some justice is a driving force. For others, the idea of reliving the whole matter in police reports or in court, is too much to bear. Lodging any complaint or taking legal action can take years, can be soul-destroying, expensive and may, ultimately, be unsuccessful. Another consideration for some people is that reporting a matter of abuse can mean that it becomes common knowledge - to family members, colleagues and the public. 1. You can contact the police. If you believe that a criminal act has taken place, report it to the police. It does not matter if the alleged offence took place yesterday or 50 years ago. This would be the option if you are looking for the individual/s concerned to be charged and go to court. Be warned that the police and Crown Prosecution Service may decide that there is not sufficient evidence to make a case against the alleged perpetrator. 2. You can make a formal complaint to the care provider. From the 1930s, most cottage homes were run by the local authority / city council, and , from the 1970s, by the Social Service department of the same. You may have to make a few phone calls to find out who to complain to. Complain in a letter and keep a copy of it. The local authority has a duty to respond to your complaint but it is up to them how they deal with it - whether the police would be called in, the scale of any investigation and the outcomes of the process. 3. A third option is to engage the services of a legal firm. They could advise you about the possible course of action - such as, perhaps, sueing the local authority responsible for your care at that time. By this means, you may win financial damages for the abuse you experienced but the legal process can be expensive and lengthy. For an update on the allegations relating to Jimmy Savile in childrens homes, please go to this page. For an update on other high profile abuse investigations, please go to this page. emotional abuse and neglect of children in care was widespread in the child care system of past decades"
or other organisations, including religious orders. and welfare between 1945 and 1995. Several victims of abuse at Portsmouth Cottage Homes received undisclosed damages from Portsmouth City Council after abuse in the 1950s and 1960s. No-one, however, stood trial for the abuse. More. A police operation in Birmingham started in 2000 focused on Tennal but was broadened out to include other children's homes run by Birmingham City Council. The investigation has resulted in the trial and imprisonment of five former members of staff of former children's homes. Some people might find it useful to get access support for themselves. Your GP, for example, may be able to refer you to counselling. The Care Leavers' Association may be able to help you - both with information and support. Through Care Leaver's Reunited, you may be able to find other people who have had similar experiences. NAPAC, the National Association of People Abused in Childhood, offers support to survivors.